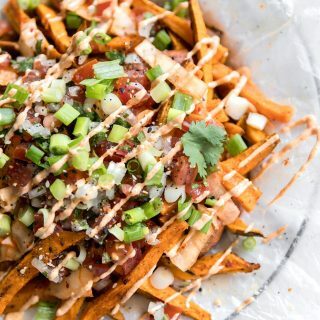 The best kimchi fries! 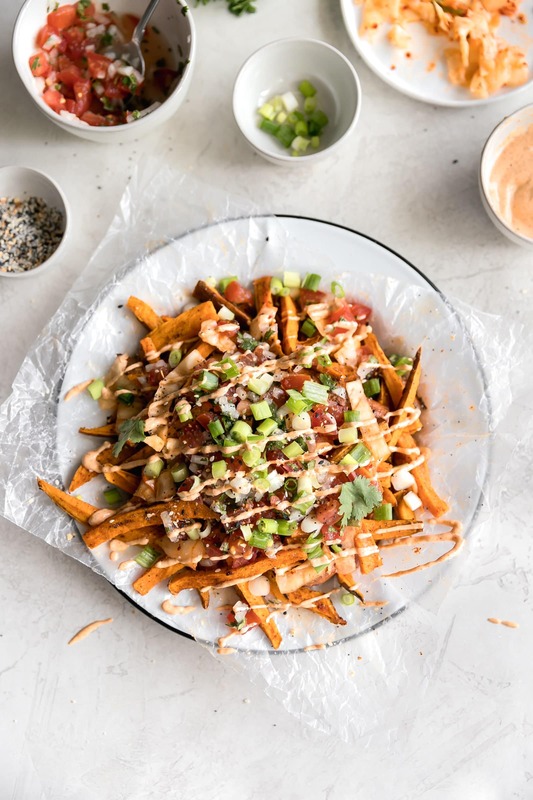 Crispy baked sweet potato fries topped with kimchi, pico de gallo, green onions, everything bagel seasoning, cilantro and spicy mayo. What does kimchi taste like? It’s kind of hard to explain what kimchi tastes like but I’ll try. Kimchi tastes spicy (duh), salty, and pickled. Kinda like spicy sauerkraut. If you’re a sauerkraut fan, then you’re in for a wild ride! 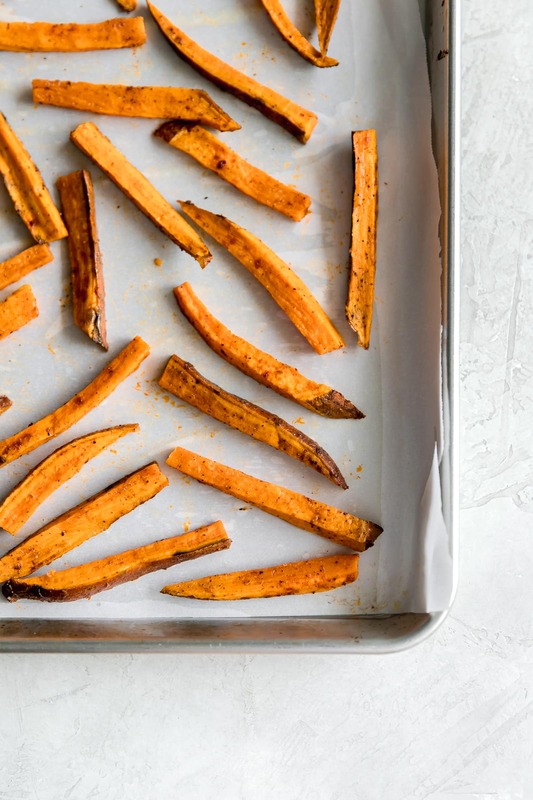 First, you make crispy baked sweet potato fries. The secret to crispy sweet potato fries? Cornstarch! (or arrowroot powder). As little as a tablespoon of it goes a long way. 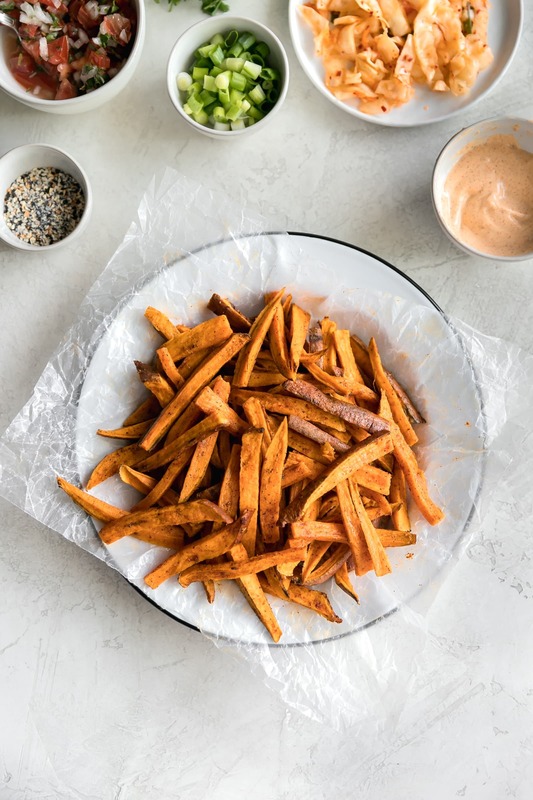 You toss the sweet potato fries in olive oil, spices, and cornstarch or arrowroot powder and you’re good to go. Place them in the oven at 450 degrees F. Twenty minutes later, you got delicious fries ready for toppings! While the fries are baking, take advantage of the time by making the rest of your ingredients. pico de gallo – a simple tomato, onion, cilantro, and lime juice combo which give these fries some much needed citrus. They are spicy, ya know? You def want a mix of flavors and this is it. spicy mayo – homemade or store-bought because why not. If you don’t like spicy, you can probably just do ranch or maybe cilantro garlic sauce but nah, I wanted to whole experience! rest of toppings – green onions, trader joe’s everything bagel seasoning, and cilantro. Maybe some lime wedges too. Ahhh, you guys. 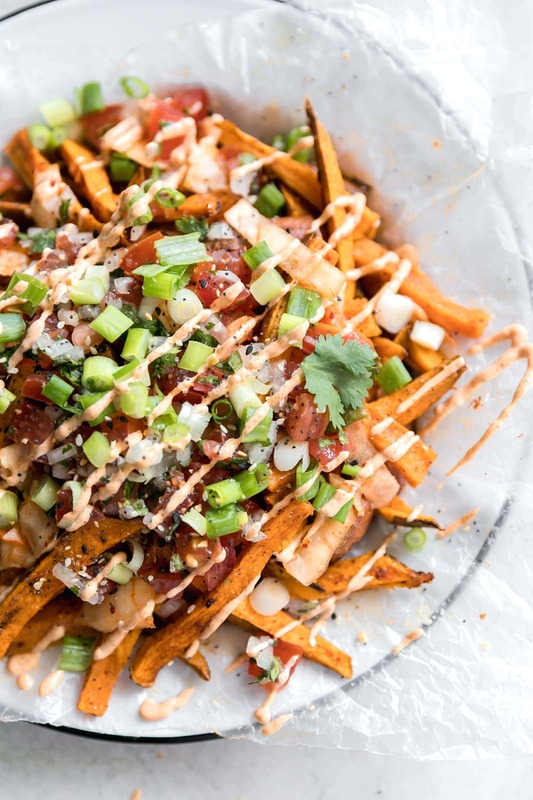 I can’t wait for you to try these loaded kimchi sweet potato fries! I hope you make them and LOVE them! Make the pico de gallo. In a bowl, mix together tomatoes, onion, and lime juice and place in the fridge until ready to use. In another bowl, mix together mayo, cayenne powder, and lime juice. Set aside. Preheat oven to 450 degrees F. In a bowl, toss sweet potato fries with olive oil, salt, pepper, smoked paprika and garlic powder. Bake until tender, about 20 minutes. Let cool. In a hot skillet, warm up the kimchi for about 4-5 minutes. Set aside. 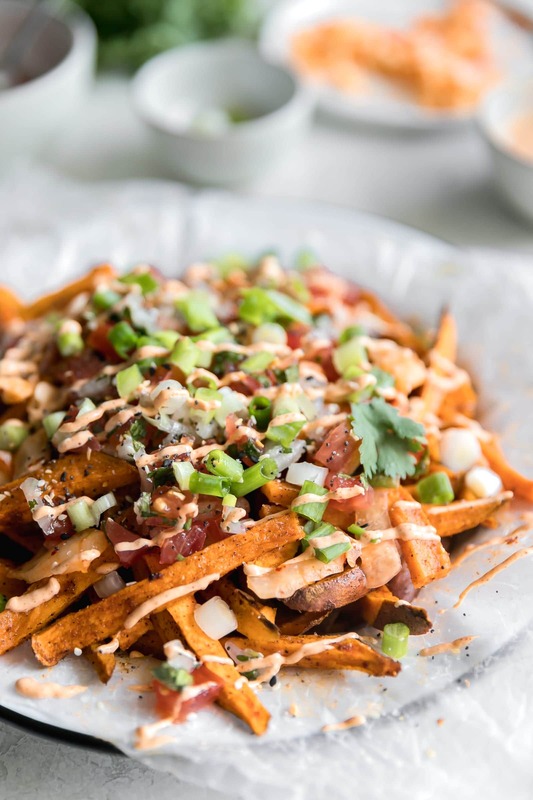 On a plate, add sweet potato fries then top with warmed kimchi, pico de gallo, sliced green onions, chopped cilantro, TJ's everything sesame seasoning, and drizzle with spicy mayo. Serve immediately. Enjoy!